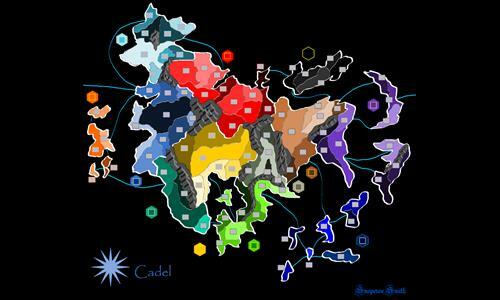 The world of Cadel is plunged into war as the Twelve Realms splinter and each of the factions fight for supremacy. Thank you for the feedback, everyone. I took a lot of risks with this map. I would like to make a second map of this world that is perfect. I lost my testers... they all got wives and kids now. The more feedback I get, the more improvements I can make. Thank you for the reviews already given. If you want to see this fully functional and playable, add me as a friend and let me know if you're willing to help test this. Also, a book is in the works that this map is based on. Again, thanks for the support. You guys are awesome. Review by cinereaste on 4/1/2013. This map has a lot of interesting terrain. The bonuses seem a little unbalanced. The orange bonus on the left is 2 for five territories, but the blue in the lower right is 2 for seven territories, and the turquoise in the lower left is 3 for four territories. Like Teckmantle, I found it difficult to see who owned what. Review by Teckmantle on 3/31/2013. It's a good map, but it'd be a better one if it stuck to the usual Warlight map conventions. The itsy-bitsy boxes and the variety of colours make it difficult to see. In it's present shape, I won't be playing it again. Review by Krulle on 9/6/2013. Otherwise, the beforementioned colour scheme is rather unhandy. Review by gui on 4/3/2013. It took me some time to get used to the coloures, because only the numbers are coloured and identify the owner of an area. Some areas are seperated by mountains which can´t be seen easily. But I like the map though - well done! Review by Bardaf on 10/20/2013. The map is not bad but the colors on lands make it pretty unclear to see who is where. Review by Captain Carrot on 4/1/2013. Some regions don't connect when they touch each other. Colored regions make ennemy less visible. Review by Neil Barnes on 10/8/2014. The connections aren't obvious and there's a lot of dead ends. The visuals are lovely, and it was playable despite the flaws. Review by Teddybär on 11/7/2014. Playing the map was difficult because of visual ability to discern neighbors, and where you are on the map, and the bonuses really unbalance it.